I said last year in my introductory Walking With Horror post that I was going to repent of my dire neglect of the horror genre this New Year and I have. Indeed it did start shortly after that post last year when I saw William Friedkin’s The Exorcist. I then saw the terrific Australian horror flick, The Babadook later on before the year ended. Early this year I proceeded to take on them both again for a second viewing I what made for a supreme horror double bill. Both films are similar thematically with the same mother child dynamic and chilling sense of dread and melancholy at the center of things. The Babadook has more chills, guile and paints a much more harrowing portrait than The Exorcist in my opine but that just speaks to the benchmark Friedkin’s film has set in the history of cinema as it has over the years influenced tons of films, The Babadook included. I confess I was expecting more by the way of scares and creeps from The Exorcist. Reports from 1973 when it was released and the numerous bans it received speak to the panic it visited on audiences with people running terrified out of screenings but on my second viewing and ensuing consideration, I dare say the effects are alas now dated and a tad funny. The film however makes it mark providing a truly harrowing and equally gripping crux that sees a mother watch almost helplessly as her child is condensed by evil. Why she is consumed by this evil, we do not know. 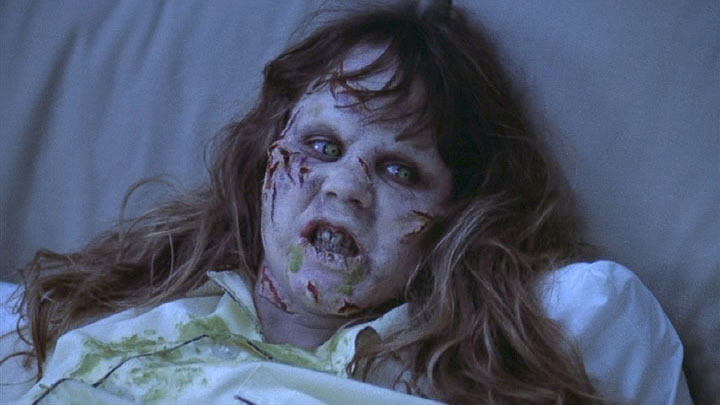 The Exorcist may be low on jump-out-of-your-seat scares but it truly is a transcendent film, genre and time wise. As for The Babadook however, time will tell how it holds up but on my first couple of viewings, I was really gripped. The Exorcist is an adaptation of a novel by William Peter Blatty who also wrote the script and film centers on a possessed girl, Regan Teresa, played by Linda Blair and her mother Chris (Ellen Burstyn). Even now in 2015 I found I was stunned by the lines the crossed by this film which catches us of guard with the cruelly unnerving shocks and brutal obscenities that befall this young girl and her mother. I shudder to imagine how the 1970’s audiences felt. The girl’s mother cuts a frustrated figure as everyone around tires to use science to explain her girl’s condition. The doctors and psychiatrists talk about lesions on the girl’s brain but we along with her know there’s something deeper, insidious and plain evil at work. Beds bang violently, furniture is flying all over, revolting vomit is gushing out of her mouth, necks make implausible 360 degree turns and bodies start to show up – the doctors were skeptical but we definitely aren’t. It is truly amazing the way Linda Blair allows herself to be used as a conduit of such misery, obscenities and terror and she puts her mother through a terrible ordeal and watching the genuine strain on their relationship had me in a state of edgy dread. Reading around the film, I found there was some depth to other parts of the film like the appearance of Max von Sydow as the older Jesuit exorcist. This is a nod to the religious and metaphysical conflict in some of Bergman’s. Some imagery like the shot early in the film that has von Sydow facing an ancient, statue which references Bergman’s famous chess game between von Sydow and Death in The Seventh Seal. I haven’t seen any of Bergman’s work and maybe some years down the line after some significant exposure, this film will carry more meaning. There is another and younger Jesuit priest here, Damien Karras (Jason Miller) who is cloaked in that aura of melancholia that is a mark many good horror films. He is tortured by his relationship with his mother and her subsequent death and he also faces a battle to hold on to his faith as poisonous doubt begins to creep in. He is the one Chris, who was agnostic (but not anymore I bet) turns to in desperation to save her daughter. This sets the scene for the famously shocking and excruciating exorcism parts that make the drumstick scene in Killer Joe look like kids hour. This is a film that will at best impress folk but forget about an enjoyable experience. This is a truly disturbing experience and the director does nothing but try to shock us and successfully at that but how does it compare to the other half of my double bill? No less a personality tan William Friedkin himself called it the scariest film he had ever seen – I am of course referring to The Babadook. The Babadook, from Australian director Jenifer Kent starts out by creeping us out then transitions into very disturbing territory and rounds off by dropping the scares and the chills. Lots of people, some of great prominence including William Friedkin have hailed this Australian film as the greatest horror film in a minute and rightfully so because it ticks all the boxes the most intense and sensational parts of The Exorcist tick. In truth, this film plays more like a scary and thrilling visceral psychological drama. Amelia (Essie Davis) plays the part of the distressed mother to young Samuel impressively portrayed by Noah Wiseman. Early on in a scene that sets the tone for this compact film, Amelia’s husband is killed whilst rushing her to the hospital during labor as one life is given for another – her son is now a reminder of that tragedy and a love lost. We see some semblance of that impact early on as she appears to be shunning intimacy with her little boy, avoiding his touch. Samuel is a very weird kid to say the least. He lives in his own extreme world which sees him prepping rudimentary type weapons with which to protect himself and his mum from imaginary foes. It is a painfully solitary life he and his mother live. The only friend Amelia seems to have is her sister, Claire, but that relationship goes out of the window when little Samuel, slowly manifesting into a little terror, damn near kills his aunts daughter. At this point we struggle to really empathize with the boy and his issues and I dare say I started to fear and worry about him and of course in the backdrop of everything is the Babadook. 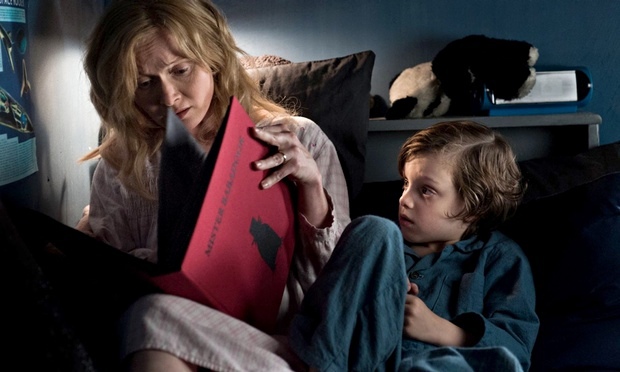 Sam discovers children’s book that warns of the evil Babadook which his mother reads to him as a bed time story. Now was Babadook already lurking? Was he brought to life by this mysterious children’s book? Is he a manifestation of their memories that haunt them? Are they the Babadook they fear? All valid questions upon viewing this film but the only thing not in question is the terror visited on this mother and her child and indeed us watching. Aside from the obvious horror of a spectral monster in a top hat emerging from the shadows, there is the more visceral terror of mother – son relationship turned on its head to a murderous extent as our fears are shifted onto Amelia and the worst part is there is no possession, no demon pulling strings in the backdrop, just a mother pushed to the edge of an abyss and in truth there are times the awareness of the Babadook lurking made feel better. Things get so bad the monster feels like the one redeeming part of the film. The film has a terrific script and the direction in this terrifying and compact film is awfully efficient, not a single scene wasted. The decision by Kent to have a lot the events seen through the eyes of Amelia adds to the effect and she shows great reverence for prior films like the aforementioned Exorcist and The Shinning. The performances from the duo of Davis and Wiseman are truly riveting and we more than buy into the despair and corroded innocence they embody during this Freudian nightmare. I think I like horror movies—well that’s easy to say when I’m picking and choosing. When some sill “quiet quiet bang!” film is screened at Silverbird then I’ll learn some sense. Next on my walk through the Horror genre is a Guillermo Del Toro double header: Cronos and The Devil’s Backbone all in preparation for his release later in the year, Crimson Peak.